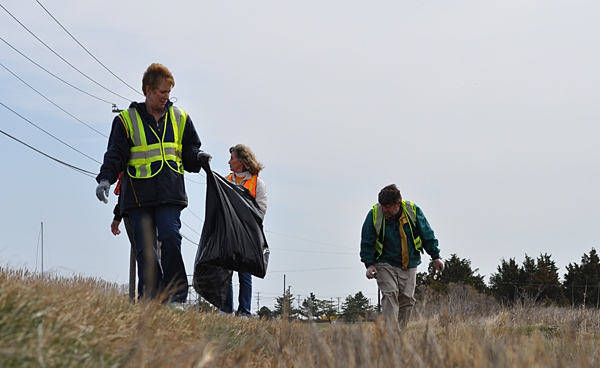 Volunteers clean up a road near the Hugh R. Sharp Campus in Lewes as part of an Adopt-A-Highway project. 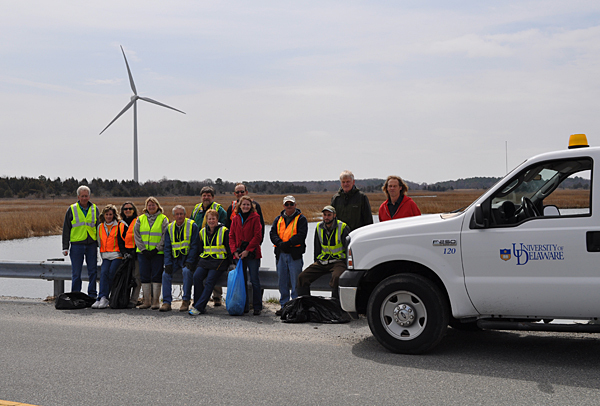 The University of Delaware Adopt-A-Highway team. 1:32 p.m., March 29, 2011----The Delaware Department of Transportation says its Adopt-A-Highway program is “about people caring enough to make a difference.” Volunteers from the University of Delaware's Hugh R. Sharp Campus demonstrated their commitment to the environment Tuesday, March 22, when they held their first Adopt-A-Highway cleanup of Pilottown Road in Lewes. The campus has adopted a two-mile stretch of the road near the campus, which sits near the mouth of Delaware Bay. As part of the project, volunteers will take part in at least three cleanups a year in which they collect litter and debris from the road. “A number of us walking or biking that road noticed a general accumulation of trash so we asked about adopting the highway,” said Joe Farrell, a resource management specialist with Delaware Sea Grant who organized the effort. For members of the Lewes campus, environmental stewardship is all in a day's work. Research taking place at the complex benefits everything from water quality to fish populations. Their efforts have also made the campus itself more environmentally friendly. It is powered by the clean energy of a wind turbine and landscaping includes a native plant garden and recently installed demonstration rain garden. Keeping a nearby road clean was an obvious next step, Farrell said.